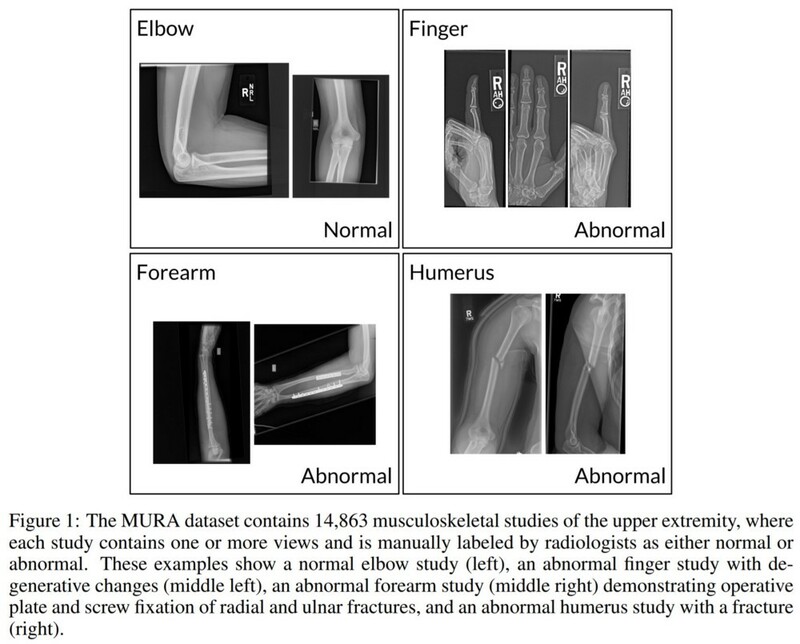 (source) MURA (MUsculoskeletal RAdiographs) is a large dataset of bone X-rays that allows to create models that determines whether an X-ray study is normal or abnormal (we could use as well this dataset to classify bones into the categories shoulder, humerus, elbow, forearm, wrist, hand, and finger). MURA is one of the largest public radiographic image datasets. Musculoskeletal conditions affect more than 1.7 billion people worldwide, and are the most common cause of severe, long-term pain and disability, with 30 million emergency department visits annually and increasing. The Stanford ML Group hopes that their dataset can lead to significant advances in medical imaging technologies which can diagnose at the level of experts, towards improving healthcare access in parts of the world where access to skilled radiologists is limited. 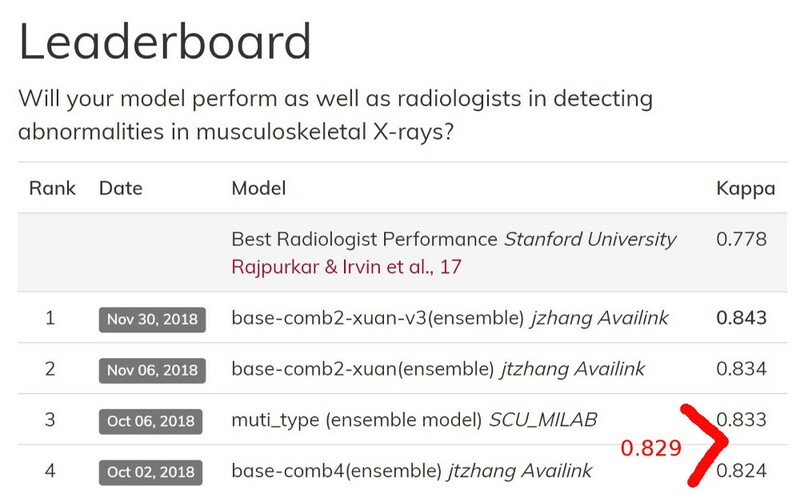 This dataset is available to the community and the Stanford ML Group is holding a competition to determine if the models created can work as well as the radiologists on the task (note: read the MURA Submission Tutorial to know the process of submitting your results for official evaluation). (source: paper, May 2018) The MURA dataset contains 40,561 images from 14,863 studies. Each study contains one or more views (images) and is manually labeled by radiologists as either normal or abnormal. Theses images are divided into 36808 training images (within studies) and 3197 validation ones (within studies). 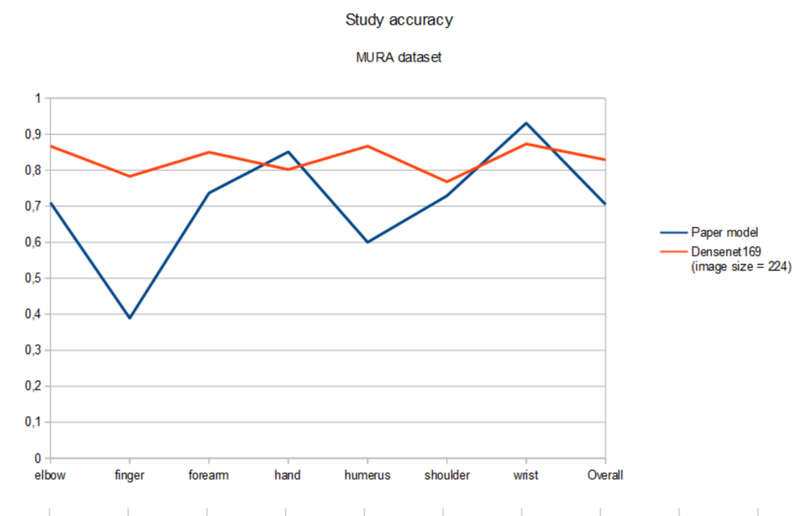 We used fastai v1 on the MURA dataset in the context of the MURA competition (see our jupyter notebook). We used 2 pretrained models: a simple one (resnet34) and a much deeper one (densenet169, the one used by the paper writers) in order to demonstrate what can bring a deeper pretrained network in the health world of classifying radiographies images. Our 2 models (resnet34 and densenet169) ont dépassé l’accuracy globale par étude du paper model. Ramené à chacune des catégories, notre meilleur modèle (densenet169 avec image size = 224) échoue à battre le paper modèle dans seulement 2 catégories sur 7: hand et wrist (cf tableau de comparaison suivant et diagramme ci-cessous). The overall accuracy of our model (densenet169) is 0.829 and it would allow us to get the 4th place of the MURA competition (see screenshot below of the MURA Competition leaderboard). The overall accuracy of our model (densenet169) is 0.829 and it would allow us to get the 4th place of the MURA competition.